Sam Hulsey is a student at Middle Tennessee State University and an ISA Featured Blogger. Sam is currently studying abroad with ISA in Cusco, Peru. After a month in Cusco, I have my daily routine down. I wake around 7:00 a.m., sit down to a breakfast of Ciabatta, fresh fruit juice, and Mate de Coca, and am on my way out the door. As I walk down the sidewalk I feel a sense of anxious excitement. However, this excitement does not come from the fact that I’m about to visit ancient Inca ruins, attend Quechua language class, or go teach guitar lessons at an after-school program. I am always looking forward to these events, but I find nothing quite as interesting as riding the bus. It’s a five minute walk from my homestay to the nearest bus stop or, “paradero.” At this point it’s 8:00 a.m. and the city is bustling. Young boys are shining the shoes of old men reading the paper, Quechua speaking women from the countryside (Campesinas) are selling fresh Huacatay, Choclo, and potatoes spread out on hand-woven blankets, and small children hold the hands of their parents as they cross the busy street making their way to the local elementary school. I make it to the stop and as I wait for my bus, “San Jeronimo”, I watch as the others efficiently conduct their runs. Arriving first is the “Pachacutec”, then “Tupac Amaru” followed by “El Zorro”. These decrepit whales of a vehicle barrel down the street, zigging in and out of traffic in perfect chaotic harmony. 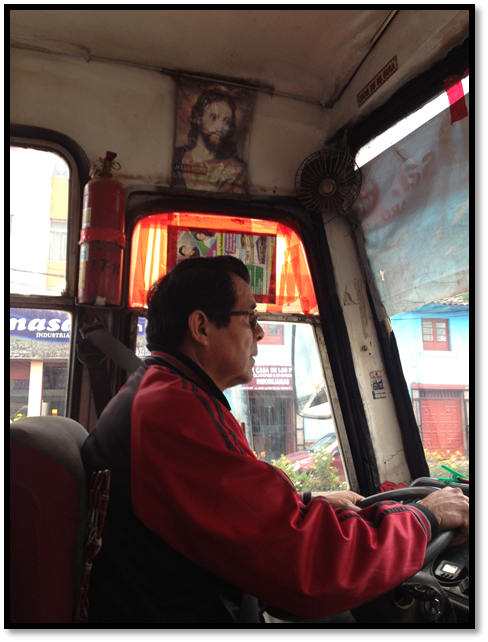 With a broken speedometer, a high-pitched horn, and utilizing his left hand as a turning signal, this San Jeronimo conductor concentrates on the fast tempo of traffic along Cusco’s Avenida de la Cultura. A foot of lead on the gas and a steady hand on the wheel he brings the 6-ton vehicle to a halt inches before the ramming the bumper of the car ahead. Finally, I see the red behemoth, “San Jeronimo” coming my way. It stops on a dime at the paradero and young man jumps off ranting the different stops on the route: “Magisterio! San Jeronimo! Chachimayo! Garcilaso! Toda la Cultura! Toda la Cultura!”. His words are machine gun fire. A profession that requires agility, quick thinking, and sure-footing, the “boleteros” or fee collectors, are usually young men. However, I have seen the position filled by a 6-year old boy and several women pushing 80 that have been more than able to hold their own. As passengers unload he shouts, “Baja, baja, baja, baja” (Get down!) and as others climb aboard he encourages them with a stern “Sube, sube, sube, sube” (Climb up!) I make my way up the stairs and immediately grab one of the rails on the ceiling as the driver takes off as soon as traffic begins to move, whether everyone has boarded or not. One must be on his toes. It is usually standing room only on the 8:15 a.m. San Jeronimo, but today I have found a seat in the back; the perfect place to observe. After the jolting acceleration of the bus, the next thing that hits me is the language. I eavesdrop on conversations, eager to see what I can pick up. Business men are talking of the recent “Paro” (2-day city wide strike in protest of gas prices), a university student is apologizing to an elderly woman for stepping on her toe, and a mother is struggling to keep her 7-year old son from antagonizing his little sister. Among this sea of Spanish I also hear some Quechua being spoken between campesinas en route to the Wanchaq Market with their heaping bags of fresh produce. These colorful blankets are utilized it everyday life to carry produce, dry goods, as well as infants! One will seldom find a Peruvian using a stroller. I’ve been on board for about seven minutes and am nearly halfway to my destination. We stop at Garcilaso and a man climbs on-board. He asks the driver for permission to address the passengers and he nods his head in agreement. The man positions himself in the front of the bus, greets everyone with a well projected voice, and begins his rhetoric. These impromptu addresses are my favorite part of the public transportation experience. 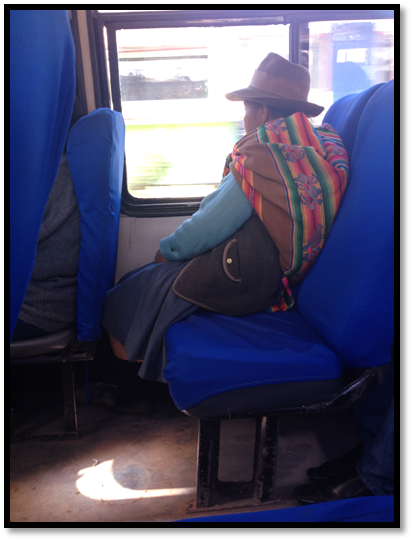 In Cusco, one can use the bus passively, as a means of transportation from point “A” to “B”, or one can use it actively, utilizing it as a stage on wheels. 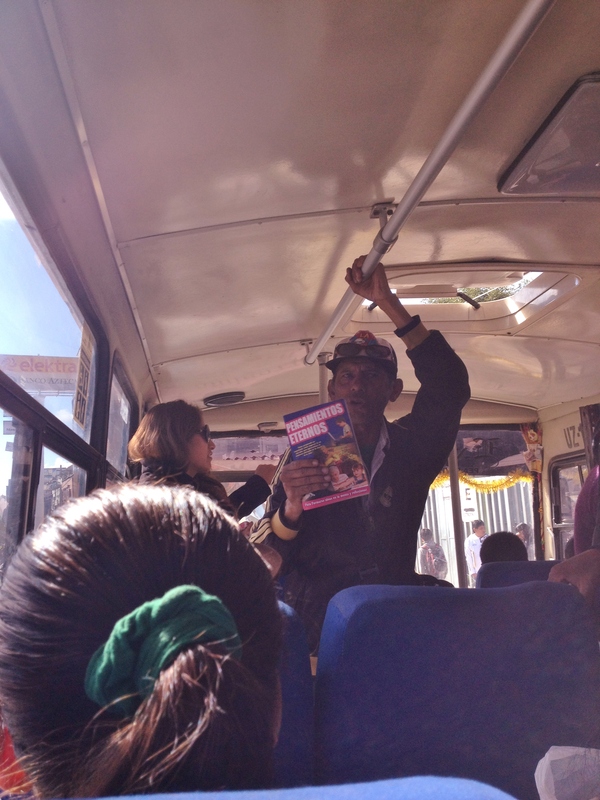 Whether it be to sell magical stomach cleansing powder, give a comedic routine, or perform your favorite Guns ‘n Roses cover, Cusqueñan public transportation facilitates the perfect opportunity to give your spiel as the buses act as mobile platforms that contain the quintessence of a captive audience. Here, a man tries to sell a magazine containing advice on battling depression and secrets to life. What fascinates me the most about these public displays is that the majority of the time they actually work! The better the speaker, the more successful he is. I’ve noticed that passengers put a high value on passion, diction, and good story telling. 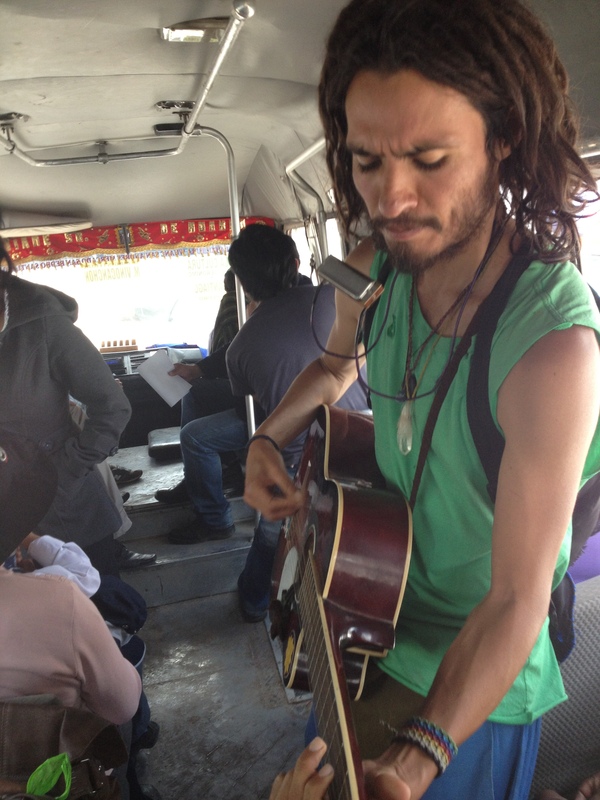 Although it may not be the most lucrative endeavor, public transportation in Peru acts as a form of economic opportunity for anyone who can be creative, well spoken, and above all, convincing. With a make-shift neck brace, this Cusqueñan pulls vigorously on his harmonica after the 2nd verse of “Knockin’ on Heaven’s Door”. 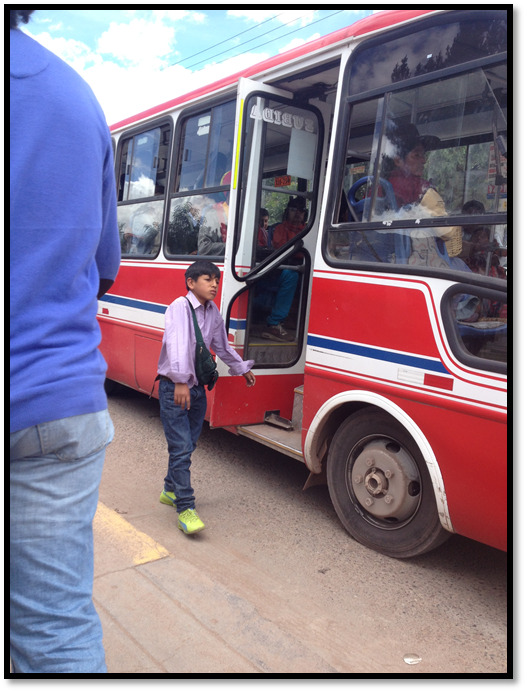 Before getting off the bus, he collects a small fortune of nearly 8 soles; roughly 2.5 USD. I’m currently enrolled in four courses through ISA, but my favorite class thus far has been riding the bus. Whether you’re currently abroad, or making plans to study out of country during a future semester, don’t let this great cultural opportunity slip by you. There is absolutely no substitute for the things that you will see, hear, and learn while navigating the public transportation system of your host country.